Protests and counter protests seem to be lining the streets in front of the Virginia Museum of Fine Arts in Richmond. The protesters: The VA Flaggers, angry that the VMFA removed the Confederate Battle Flag from the outside of the old chapel. Their protest includes waving Chinese made flags in front of the VMFA and crying out, “Return the flag, restore honor.” The counter protesters: a group of college students and locals who vociferously disagree with the use of the Confederate Battle Flag, recognizing it as a symbol of hate. Their strategy is to host impromptu rap sessions and play hip-hop/rap music within earshot of the VA Flaggers. One act of violence between the two groups occurred when a member of the VA Flaggers, and white supremacist, damaged an amplifier in use by the counter protesters. Hopefully this act of violence will be the last but with such comments as this, that seems unlikely. 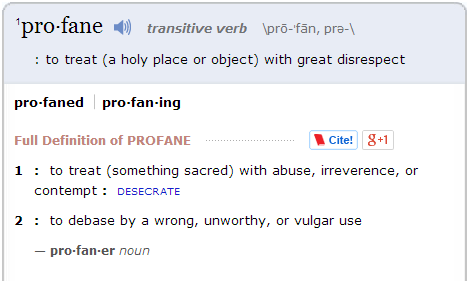 The definition of profane is not limited to words alone. Cursing, to me, has nothing to do with moral scruples as Connie Chastain alludes to. Profanity, as mentioned in the Bible, is not the same thing as our 21st century ‘swear words.’ Profane is contextual. I personally do not have a problem with words. Now of course, I am considerate of others. I recognize a natural right to raise a child without subjecting them to other people’s supposed vulgarity. I also recognize that not everyone uses profanity and that some people do think it is inappropriate. Again, consideration is the key. Which brings me to David Tatum’s recent comment. ” So let me get this straight David…you are fine with a counter-protesters property being destroyed”? Ya get outta life what ya put in it ! Toad had no consideration for folks, (who had nothing to do with the Flaggers) on the Boulevard. He subjected the average passer by to loud profanity from his equipment. He wanted attention and he got it ! I’m surprised it did not happen sooner ! That being said, I would have approached the situation differently ! 1 – I would have requested Toad to turn down his profanity. 2 – I would file a complaint with the Richmond Police. 3 – If nothing were to happen after exhausting all legal attempts I might very well do “whatever’ was required to abate the situation ! I’m honest with you so how about you being honest ? Do you approve of profanity being blasted in public ? Would you like for your children to have to hear what was being heard by the folks in Richmond ? ” You feel it is ok to make light of it when the person who did it is known”? These comments are nothing more than attempts to denigrate anyone who disagrees with the VA Flaggers’ opinions. That is why the Southern Shrieker Connie Chastain spends so much time to link myself and others to “rap music.” You know, because we are apparently inconsiderate and enjoy profanity. Well Connie, you’re half right.